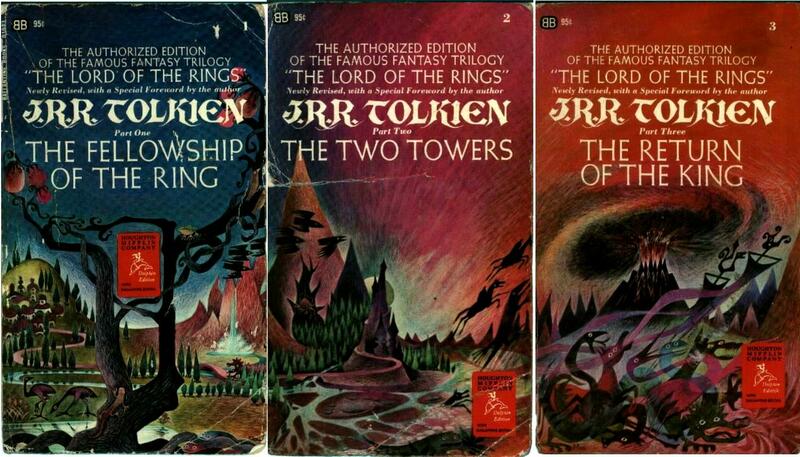 The first edition of Lord of the Rings published in the United States was an unauthorized three-volume paperback edition from Ace. My first reading copy included one of those along with two of these from the edition authorized by Tolkien and published by Ballantine. When I came to understand the difference I junked the Ace and replaced it [and probably threw away something that became valuable]. Today Lars Walker reminded me of that first full set which I read to death. This is what it looked like, although my copies fell apart long ago. While in college I bought the 1966 three-volume hard-bound boxed edition from Houghton Mifflin, which I still have, and for a time acquired every new edition that came out, but eventually the proliferation of editions overwhelmed me and I gave up. For a while in the early '70s I had a large poster on my living-room wall that combined the images from the three covers above.